The historical gardens offered pleasures more extensive than those available today, but the past few years have seen the Gardens reclaim one aspect of their former glory: people are using them again, as a through route, as a place to linger. Within the Gardens is Vauxhall City Farm, a stalwart which, if memory serves, dates from the early 1980s. 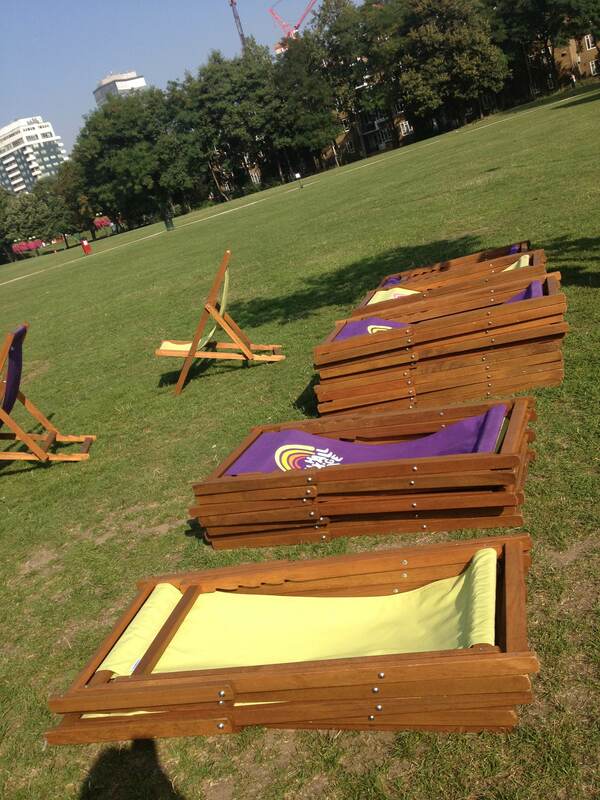 But this is simply background to my actual subject: Deckchairs. This short post offers a variation on the theme of the previous posting, ‘Seats of choice‘. Pictures will make my point as well as, perhaps better than, words. But a few words can be permitted. 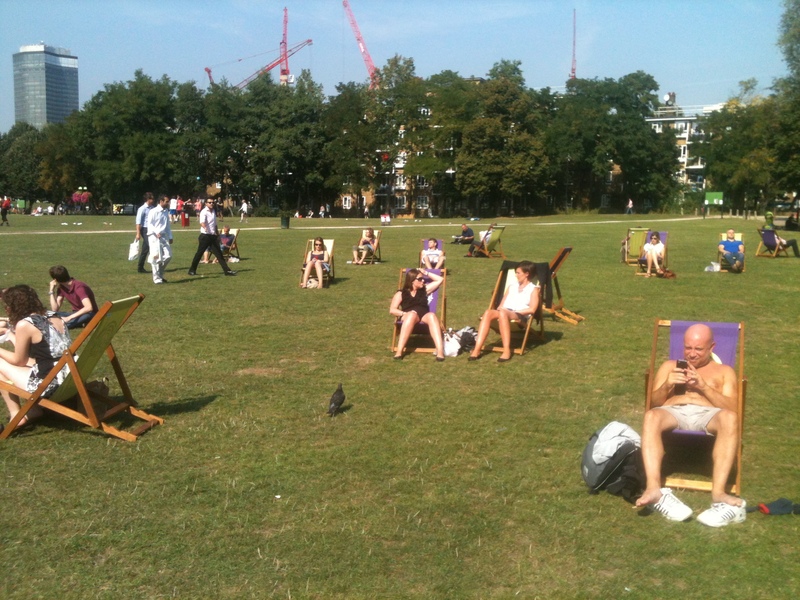 One of the benefits, so central to enhancing people’s perception of shared social space, is that deckchairs contribute to populating and animating the public realm: other people’s presence contribute to people’s sense of safety; and a little people watching. And what they also do – as with the individual, movable, free-for-use chairs in Paris parks – is to loosen up space, introducing a note of higgledy- piggledy into the public realm. They settle where their temporary mistresses and masters desire, sometimes alone, sometimes in groups. Evoking and symbolising the very ideas of relaxation and ease because, well, because that’s what deckchairs do, that’s what they mean: relax, chill. Don’t even try, don’t even try to look cool or sophisticated. 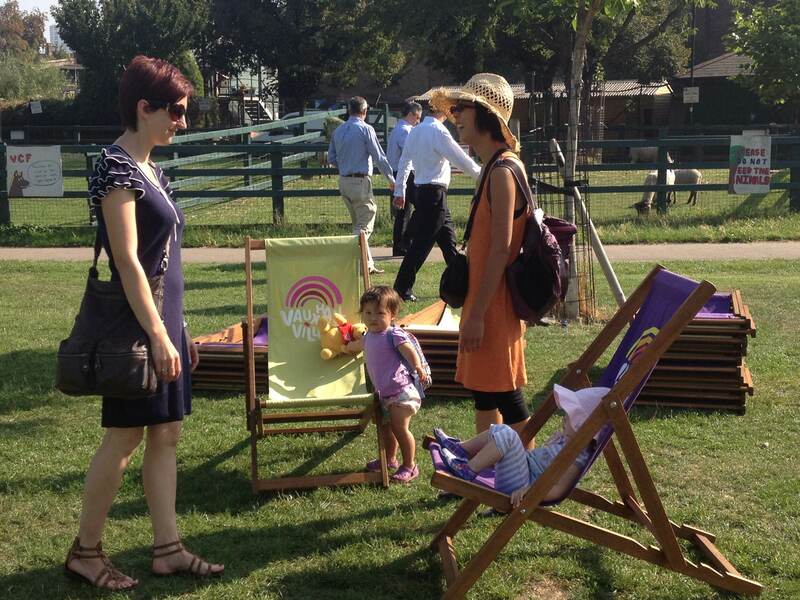 You’re in a deckchair, cool and sophisticated just doesn’t work . Underlying all this, though, is a point that needs to be put more seriously. 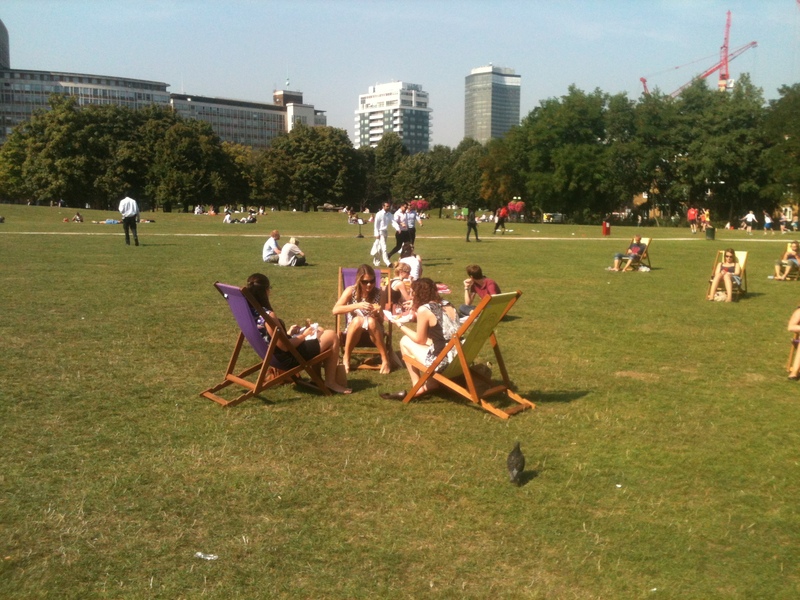 Whether individual moveable seats in parks, or deckchairs, or loose parts for play in shared public open space, all require a degree of staff presence. Call them maintenance staff, call them park keepers, call them what you will, but for the public realm to flourish, to engage with those that would use and enjoy it, care and tending is required. And only people can do that. 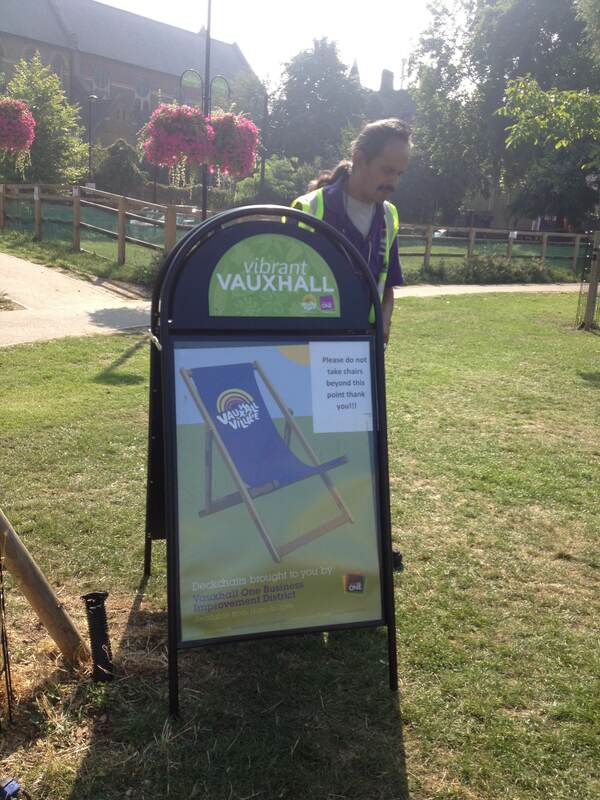 (Note, that the deckchairs in Vauxhall are not available for use to the substantial residential population at weekends.) In budget terms it’s called ‘revenue spending’; or, even more boldly: public revenue spending. But revenue spending is what we do not have. And it shows, certainly outside the magic circle of parks and open spaces thought of as ‘destination’ places. It may be, of course, that we do not much care after all. This entry was posted in neighbourhood resource, parks, places of congregation and informal sociability and tagged local community, people watching, places of informal sociability, public benefit, public realm, shared social space. Bookmark the permalink. After your Paris article I discussed the use of moveable seating in parks with colleagues and we considered deckchairs or even directors chairs. If we have a bit of funding left at the end of the year I may purchase 10 or 20 chairs for our Flagship Playspace. We have a food kiosk there and storage so the attendant could put them out in the morning and back in at night and it’s open 7 days a week in the summer. I’ll let you know what we end up doing. I should say your latest article will strengthen my argument in favour of this approach.